The clouds are cumulus. The sky is robin’s egg blue. The kids are at home asking about what to do next. Must be summer. I, for one, am dreaming of lake days at my cottage. Did I say my? I meant at your cottage. Feel free to invite me. 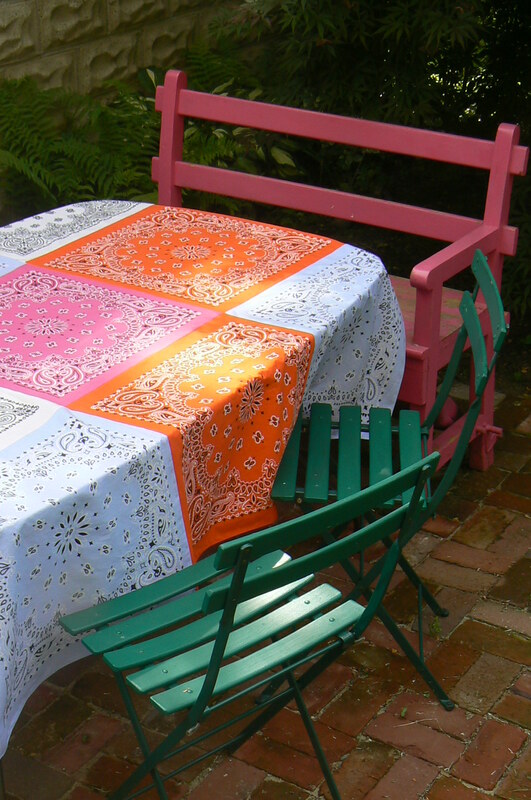 This patchwork tablecloth made out of colorful bandannas is a fun project from Aesthetic Nest. The AN version looks like perfection, wafting in the breeze. Mine less so. As AN points out in the instructions, not all bandannas are made to the same size. I found that the white ones are the runts–an inch smaller all around, making things a little more irregular. But the imperfection is what I like about the project–it doesn’t require seamless seams to look breezy, whimsical, and summery. 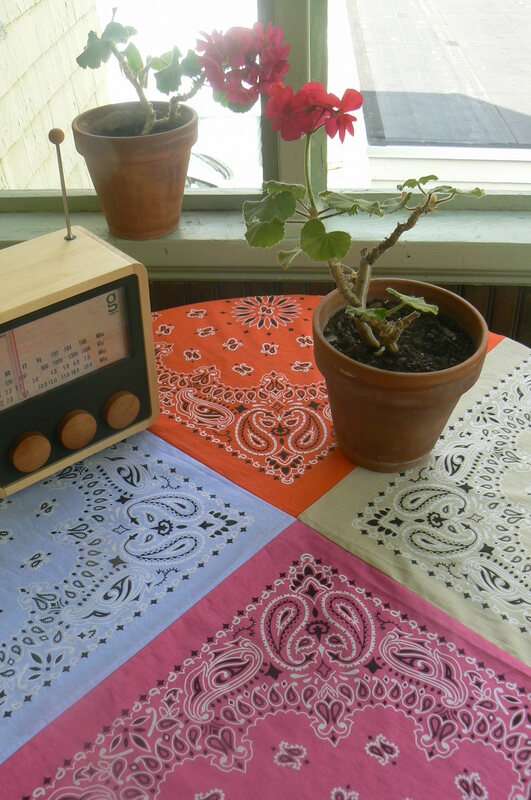 I made a square of 4 bandannas to cover the little table on my back porch. 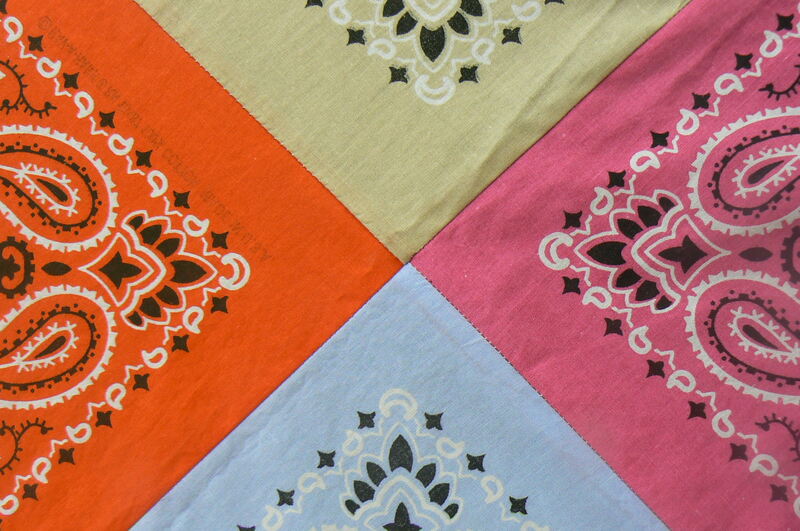 And a larger square (3 by 3) for my mom’s table at–you guessed it–her summer cottage. Not that I’m hinting, Ma, but my bags are packed. Gorgeous! So summery. Whenever I get some outdoor furniture, I’m making one of these. Unpacked my craft supplies (so many boxes!) last night, so should be back in business soon!